Can you name all 50 states on the US Map shown here? To print the map shown, simply right click on the image and select a SAVE option from your drop down menu. Then make as many copies as you like for your own personal use. Scroll down for the answer key, along with a full set of fresh and fascinating facts about the United States of America. This page also links to many more printable United States maps. Also find assorted links to land areas, zip codes, and other geographical features of states. Each of the following links will take you to a map or a list of states, with specific geographical data for each state. Zip Code Maps links to more than a dozen crisp, clear, free printable zip code maps depicting various major U.S. cities such as Philadelphia, Pittsburgh, Detroit, Miami and New York, among others. United States Map A free printable map featuring cities, roadways and geographical features. Also provides links to maps of individual states, clickable photo quizzes and more. United States Product Map shows each state's most prominent resources (GDP). Area Measurements shows a list of states ranked in order of total square miles per state. Also shows ratios between land and water areas. Miles Between Cities: This page displays an reader friendly, cross-referenced chart that shows the approximate driving distances between 48 major U.S. cities. Farmland This page features a list showing how many acres of each state's land is devoted to the farming industry. Cool photos, too. Crops This page provides a description of each state's main agricultural output, with several simple, helpful maps. Minerals This colorful page reveals an itemized list of states, along with each state's major industrial mineral production, along with clear details images of various mineral forms. Energy This page gives an overview of various natural energy resources listed by state The list includes oil, gas, coal, water and nuclear power. 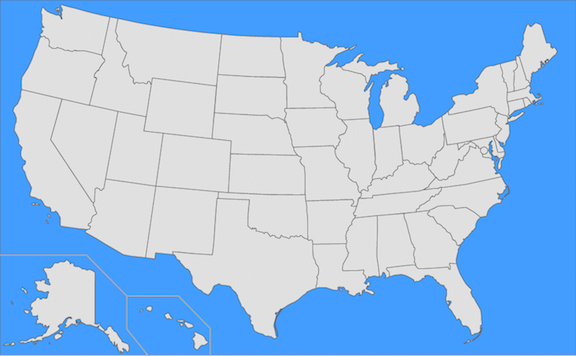 To be sure that no adjacent states are the same color on a map of the US, at least 6 colors are needed, as in the US Map shown above. The distance from the easternmost to the westernmost part of Alaska is about the same as the width of the entire US mainland - about 3,000 miles. However, not all US Maps are proportional. Roughly 80% of the land in the state of Nevada is owned by the government. A typical United States map shows all 50 states and Washington DC, but rarely shows other territories belonging to the U.S. government, such as Puerto Rico and the U.S. Virgin Islands. State borders are determined either by longitude and latitude lines, or by rivers.